As a stylist, I constantly have jobs and ideas coming in. Not every job that I pitch for gets through and ideas are written down all over the place. Once a job is confirmed I go to my Volant Moleskine notebooks (see Get Organised) and keep everything filed and in order. Before stumbling upon bulletjournal.com I would write note after note after note. If I needed information from a notebook, my only organisation was a visual one - i.e colour of the notebook used, how I had written it, doodled it or folded the corner of the page. Now I use bulletjournal.com I am not only organised but I have no problem looking back over my notes and keeping inspired and up-to-date on absolutely everything that I have done or need to do. The information below is from the bulletjournal.com website. How does bullet journaling work? Firstly, number every single page in your new notebook. Head to the first DPS (double-page-spread), title both pages as INDEX. Here write down the titles of each page of notes you have written, and number them. 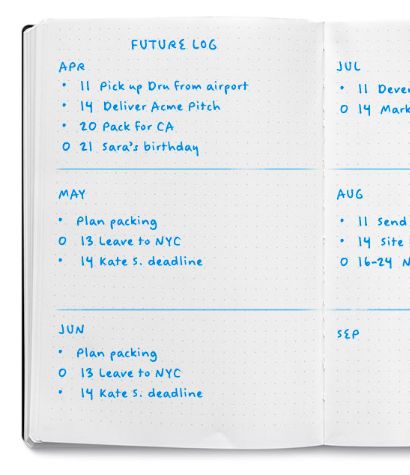 Set up your future log, turn to the next DPS, title it Future Log. Divide the page into three. Label the next six months in each box. This is where you put in future plans or specific dates that need to be booked out. Turn to the next DPS. This is your Monthly Log where you will add the name of the month on both pages. On the left will be your monthly calendar. Write down each date of the month then add the first letter of the days. On the right-hand page is your monthly task list. 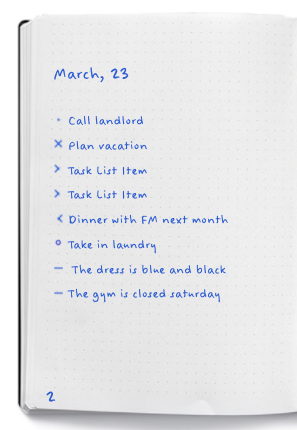 Write down everything you need to get done that month. Before each task, draw a task bullet - a simple dot. Having the monthly log in place shows you a birds-eye-view of what you have to do in the month and how much time you have to do it. Once you have done these pages add the page titles and numbers to your index. Enter the day's date, you can now start logging entries, entries are logged by adding short bulleted sentences, each entry goes into one of three categories. If a task is really important, place a little "*" to the left of it - this is known as a signifier. All the above is known as rapid logging, it makes capturing and organising information really fast. These are all the core modules for bullet journalling. I normally write this glossary on the first page of my notebook - it reminds me what every bullet signifies. Now I am on my third notebook I don't need this page formula, but it was handy when I first started journalling. At the end of each month set up the next Monthly Log. Scan your Monthly Tasks and Daily Logs and “X” the completed tasks. Take a moment to assess the open tasks and ask yourself if each is still worth your time. If not, strike it out. If it is still worth your time, turn that entry's task bullet into a "right arrow" and copy the entry into the new Monthly Log. If the task is due months from now, turn the task bullet into a "left arrow" and copy that entry into the corresponding Future Log. This process is known as Migration. Migration helps you weed out the distractions - it is designed to help you focus on the things that are worth your time. Using Collections in the Bullet Journal is a great way to organise ongoing projects. Some longer-lived projects will spread throughout your book. 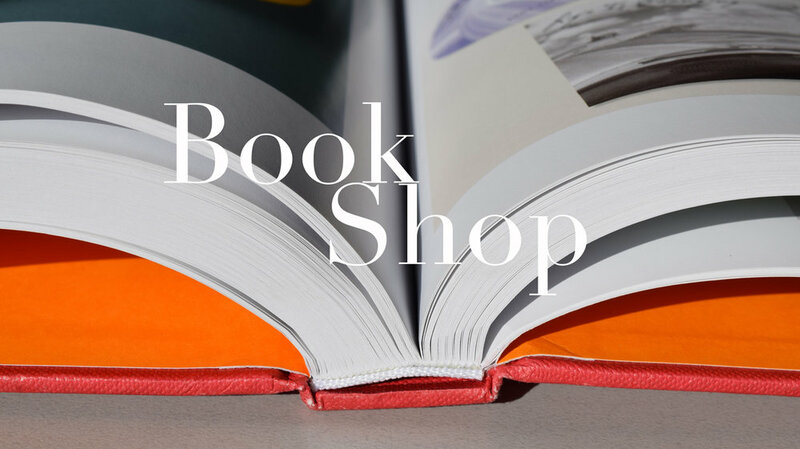 Though indexing helps you keep track of where your collections occur within the book, it can be a hassle to keep referring to your Index. That’s where Threading comes in. Let’s say you have a Collection that lives on pages 2-6 then reappears on page 14-21, and then again on pages 45-62. To "thread" this collection, simply add the page number of the previous or next instance of that collection next to the current page number. That way, when you’re working on this Collection, you don’t have to refer to Index anymore. The same rules apply if you have old notebooks but ongoing projects. I number each notebook starting at one - 01/2018, my next book will be 02/2018 and so on. When I need to "thread" projects to old notebooks, I will add the last page numbers I worked on, say page 62, but I will also add the note book number - P62 - NB 01/2018. Below you will find the bulletjournal.com video, showing you all of the above formula. Enjoy and get organised - Another world has opened up!